If you love extraordinary pistachios, you'll not only appreciate these, you won't be able to stop eating them. These are the exceptionally flavorful "new crop" pistachios, straight from California, packed fresh and crunchy for your enjoyment. 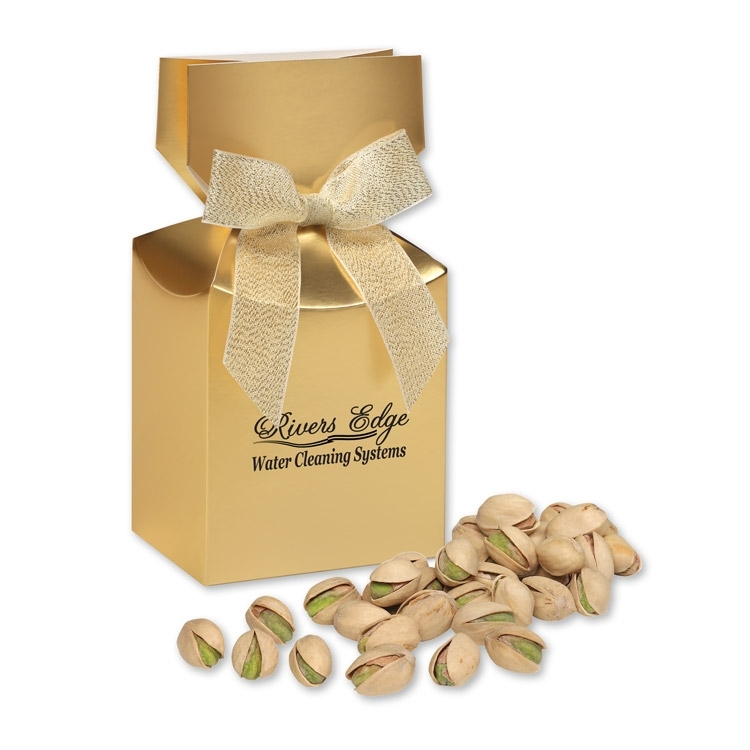 Pistachios contain iron, protein and high levels of magnesium, which helps lower blood pressure. Each gift box contains one-quarter pound. Gold gift boxes are foil-stamped in your choice of black, silver, blue, green, red, or white and complete with a neutral metallic bow. Gift Box: 3.5" × 2" × 6"
• Price includes imprint foil-stamped in silver on gift box. • Imprint Area: 2" x 2"
• Maximum Size for Customer Supplied Enclosure Cards: 5" x 3.25"
• Individual Mailing Cartons are available for an extra charge.